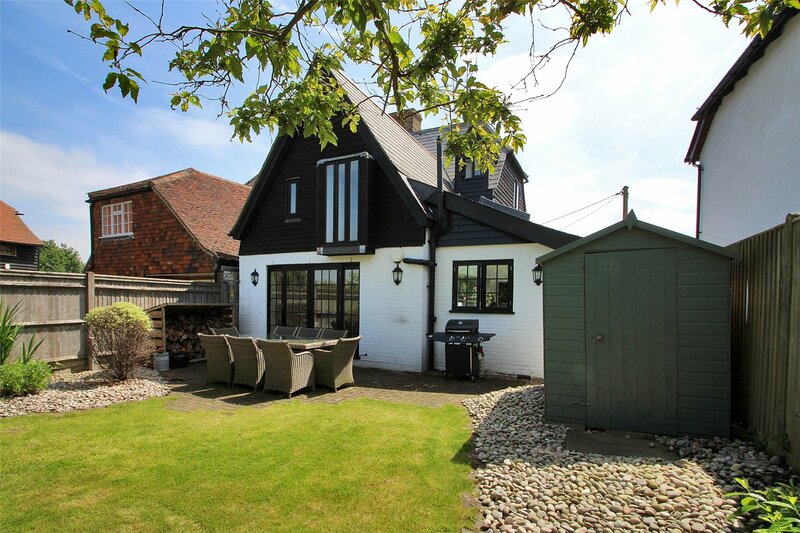 A most attractive and cleverly extended Grade II listed semi detached cottage set in a quiet part of the village with far reaching views and delightful outlook over the cricket ground Entrance Hall, Sitting Room, Kitchen/Dining/Family Room, Utility Room, Cloakroom/Shower Room, 4 Bedrooms, Family Bathroom, Off-road Parking, Garden. DESCRIPTION Walnut Tree Cottage is a charming deceptively spacious "picture postcard" Grade II Listed 16th Century semi detached cottage with colour washed and exposed square timber frame panels to front elevations with double glazed casement windows under a recently re-tiled half hipped slate roof. To the rear the elevations are colour washed lower and timber clad upper with multi paned double glazed windows. 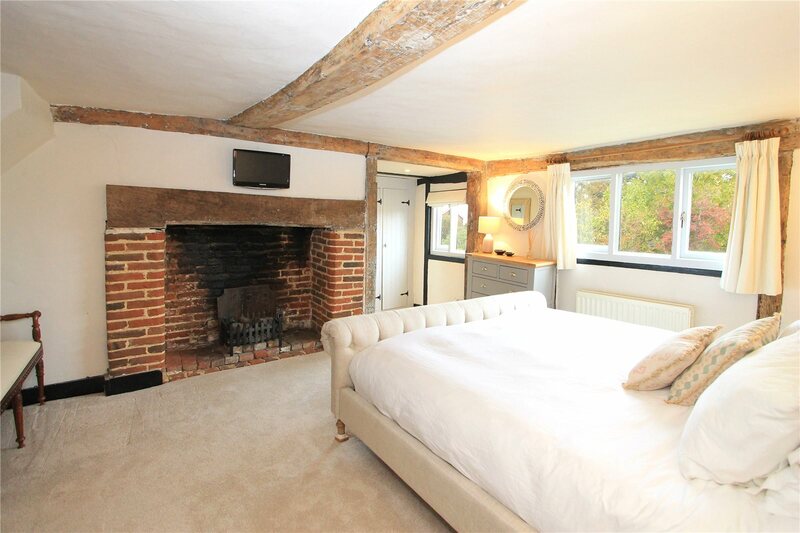 Internally there are many period features including inglenook fireplaces, exposed timbers and oak latch doors. Ceiling heights throughout the house are excellent. There are also newly fitted carpets throughout. 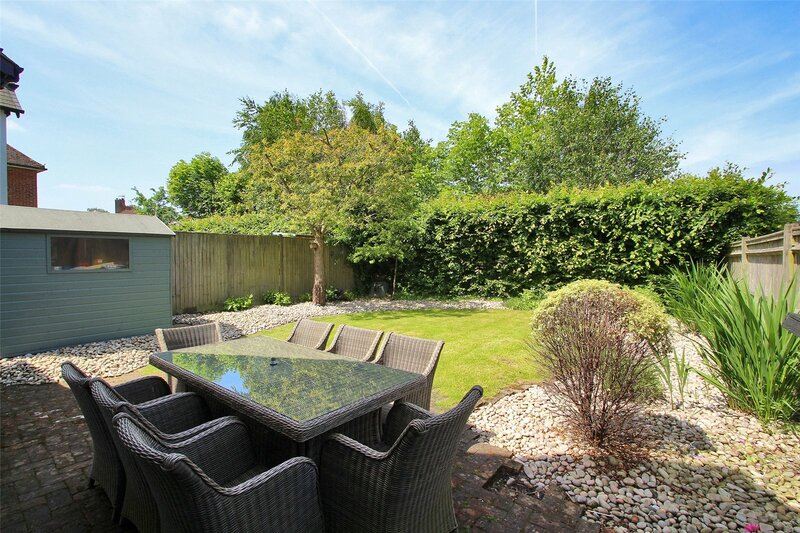 The present owners have sympathetically extended and improved the house to provide an entrance hall, shower/cloakroom and the creation of a superb Kitchen/Breakfast/Family Room as well as re-organising the top floor into 2 bedrooms. Overall the accommodation is beautifully presented. 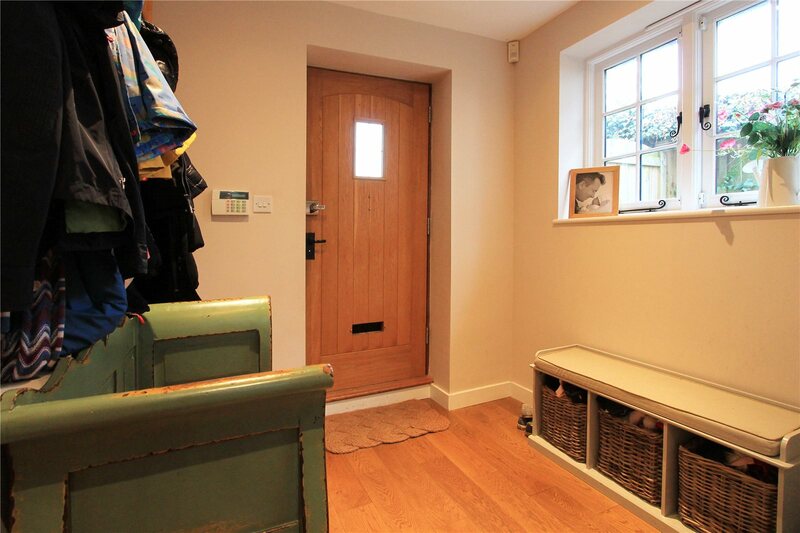 FEATURES From the entrance porch a solid oak door with glazed insert opens to Entrance Hall with oak flooring. Stairs to First Floor. Shower/Cloakroom with suite comprising tiled shower cubicle, low level WC, pedestal wash basin. Window to side with bespoke shutters, heated towel rail. Travertine tiled floor. 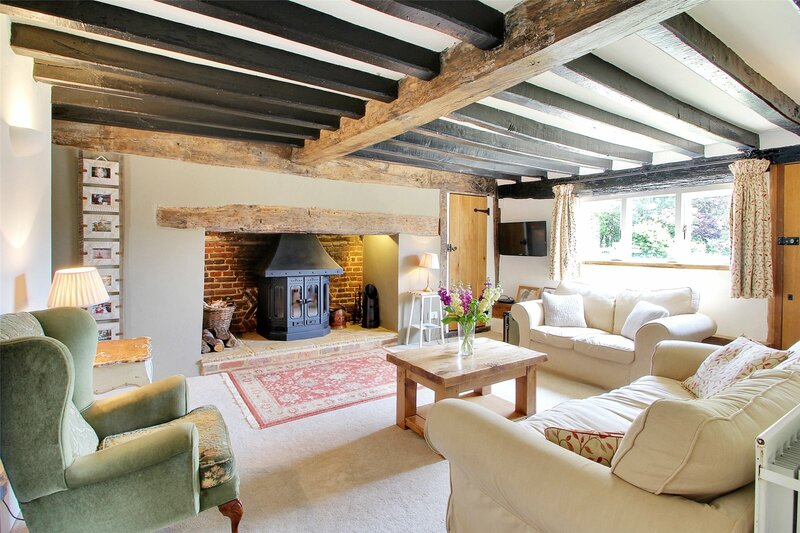 Sitting Room with good height ceiling timbers. 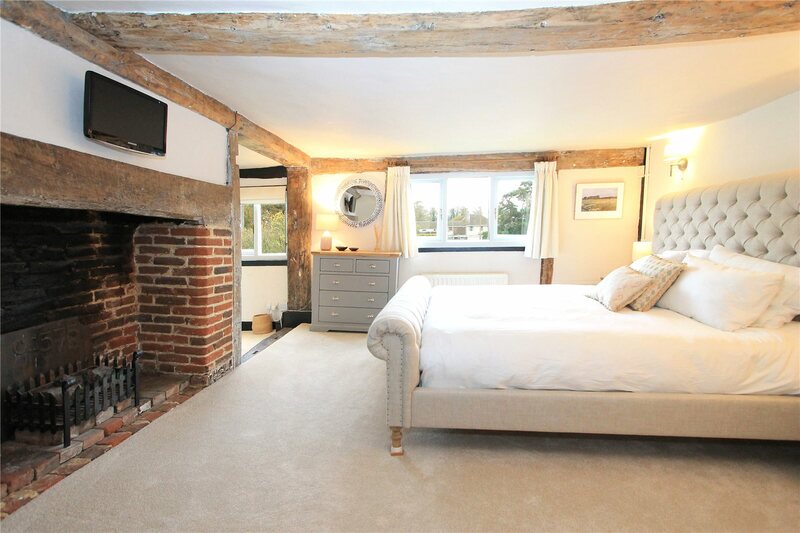 Substantial inglenook fireplace to one wall with woodburner on raised flagstone hearth. To either side are good built in storage cupboards. 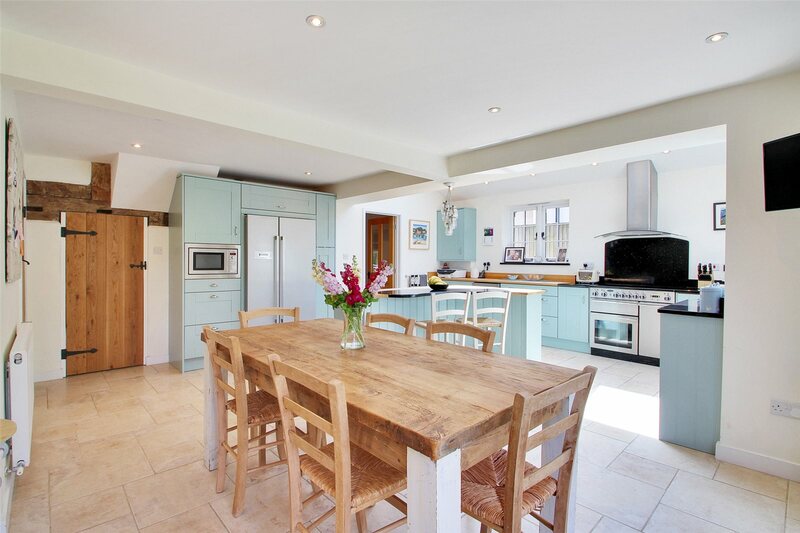 Lobby Area with further cupboard and door to Wonderful double aspect Kitchen/Breakfast/Family Room with granite and Beech wood work surface areas over a range of soft close fitted cupboards and drawers. Rangemaster range style cooker with induction hob, granite splashback and extractor over. Double butler style sink unit with swan tap over and lovely outlook to the rear garden. Fitted wine cooler and Bosch dishwasher. Further range of cupboards to one wall including pull out larder cupboard, microwave and space for American style fridge/freezer. 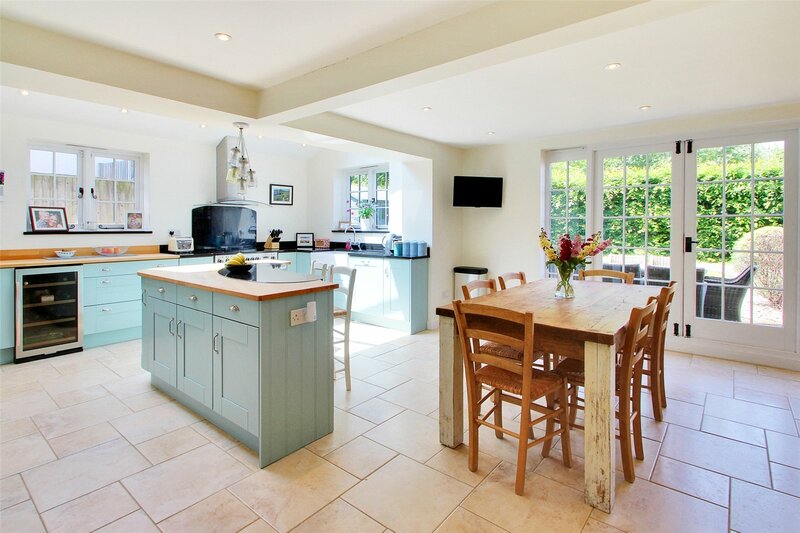 Large island unit incorporating breakfast bar with cupboards under. Travertine tiled flooring. Glazed double doors to garden. Utility Room with Beech wood work surface over range of cupboards. Double Butler style sink with swan neck tap. Plumbing and spaces for washing Machine and tumble dryer. Travertine tiled floor. First Floor approached by single flight of stairs to split level Landing with exposed wall timbers and Kent peg tiles on view. 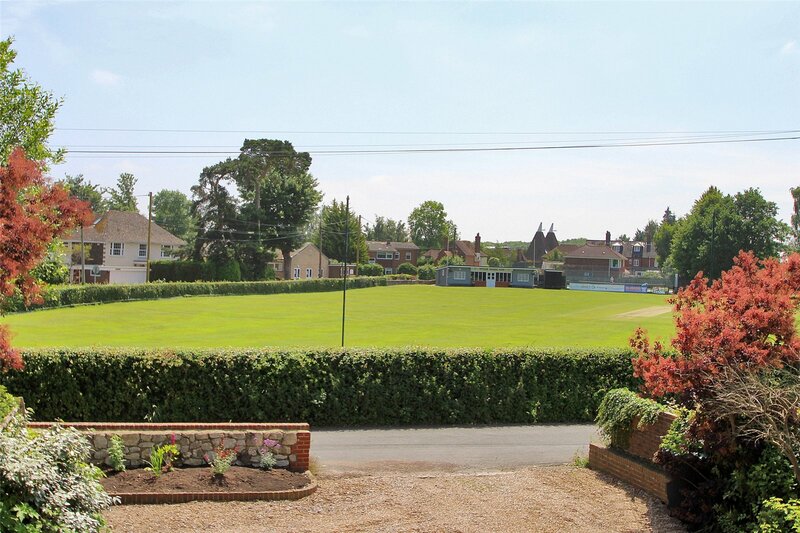 Master Bedroom is a spacious double with lovely outlook to the front over the cricket ground. Brick inglenook fireplace. Cupboards and eaves storage. 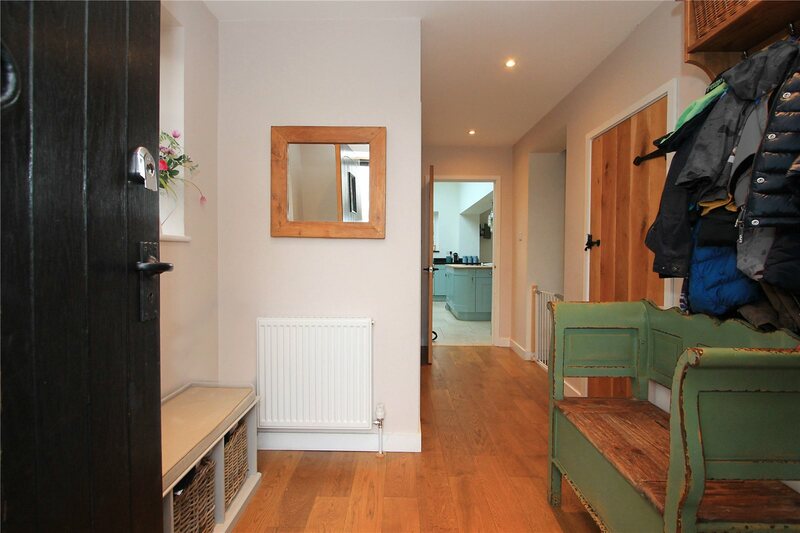 Step down to Dressing Area with built in cupboards. Bedroom/Nursery Bedroom 4 with exposed timbers to roof slope, window to rear. Built in wardrobe. 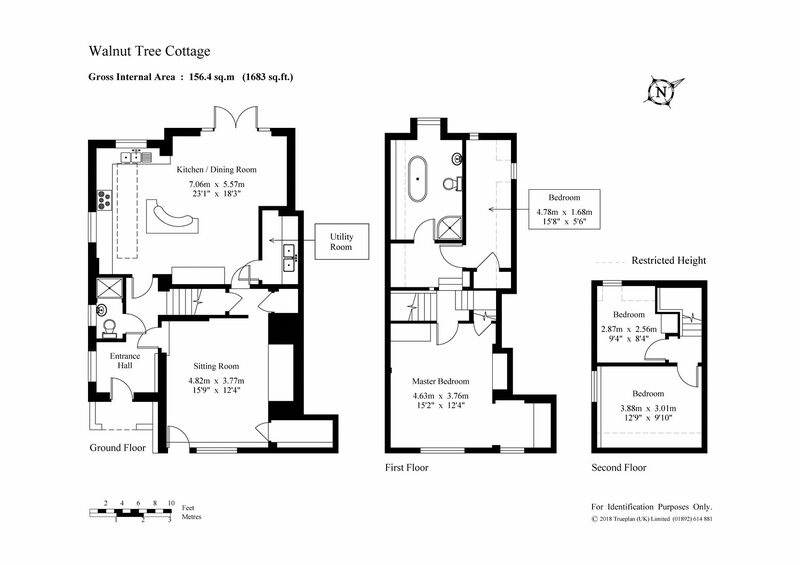 Family Bathroom with exposed timbers to roof slope. 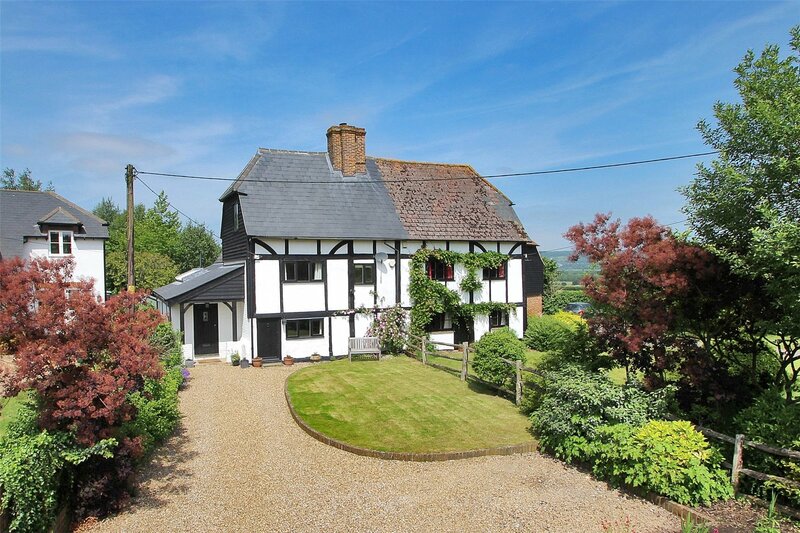 Tall floor to ceiling window with superb rural views to the rear. 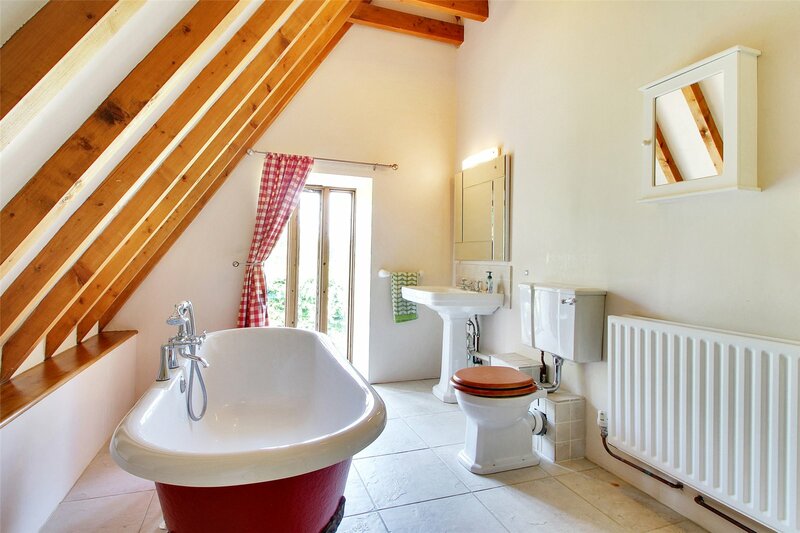 The suite comprises freestanding roll top style bath with claw feet and hand shower, corner Bristan shower unit. Low level WC. Pedestal wash basin. Stone Tiled floor. Further flight of stairs leads to Second Floor Landing Area. Bedroom 3 with exposed timbers to part sloping ceiling, window to rear, built in cupboard with hanging rail. Bedroom 2 a good double with window to side. Exposed timbers to part sloping ceiling. Access to roof space. 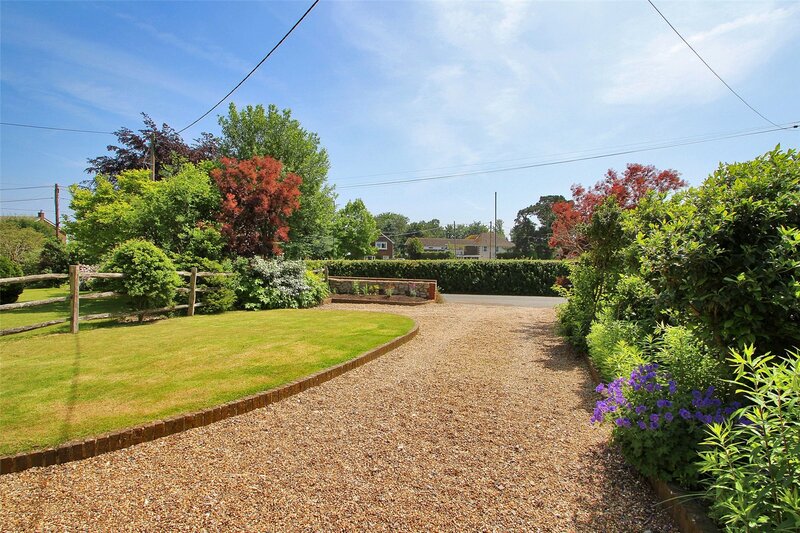 OUTSIDE A shingle driveway with turning area provides ample off street parking for up to 4 cars. Good lawned area with brick edging. Range of shrubs to border. A side gate gives access to Rear Garden with oval lawned area. Brick paved terrace to the rear of the house. Further shrubs to borders, Flowering Cherry. Garden Shed. Log Store. 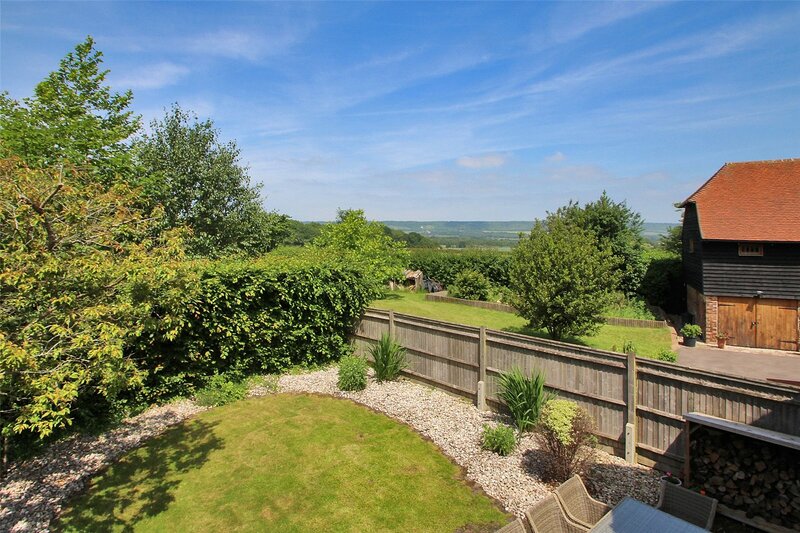 SITUATION The property is set on the edge of the popular village of Offham opposite the cricket ground and within just a short walk of the Primary School and Church. There is also a highly regarded Pub in the village. Offham is famous for having, what is believed to be, the only medieval quintain remaining in the country, located on the village green. Day to day facilities are available at The Spadework Garden Centre in Teston Road with its cafe and farm shop. West Malling (just under 2 miles) is an historic market town, offering a good range of shops, cafes, restaurants and a Tesco supermarket. It also has a railway station with services to London Victoria/Blackfriars in about 1 hour. Alternatively, Sevenoaks station has services to Charing Cross/Cannon Street and Ebbsfleet International has services to London St Pancras. The County Town of Maidstone, as well as Tonbridge, Tunbridge Wells and Sevenoaks town centres all offer wider range of facilities. The M26 (junction 2a) and M20 (junction 2) at Wrotham Heath/Wrotham provide access to the M25 and thence motorway network, Heathrow, Gatwick & Stansted Airports, London, Channel Tunnel and Ports. Offham has an excellent primary school, rated outstanding in its 2015 Ofsted report. There are also good primary schools in nearby West Malling, Kings Hill and Mereworth. There are well regarded grammar schools in Maidstone, Tonbridge and Tunbridge Wells, plus an excellent range of private schools including Sevenoaks, Tonbridge and Sutton Valence. DIRECTIONS From the Sevenoaks direction proceed towards Maidstone on the A20 turning right at the roundabout into Seven Mile Lane. Pass under the railway bridge turning immediately left into Teston Road and proceed into the village of Offham. Opposite The Village Green turn left into North Meadow. 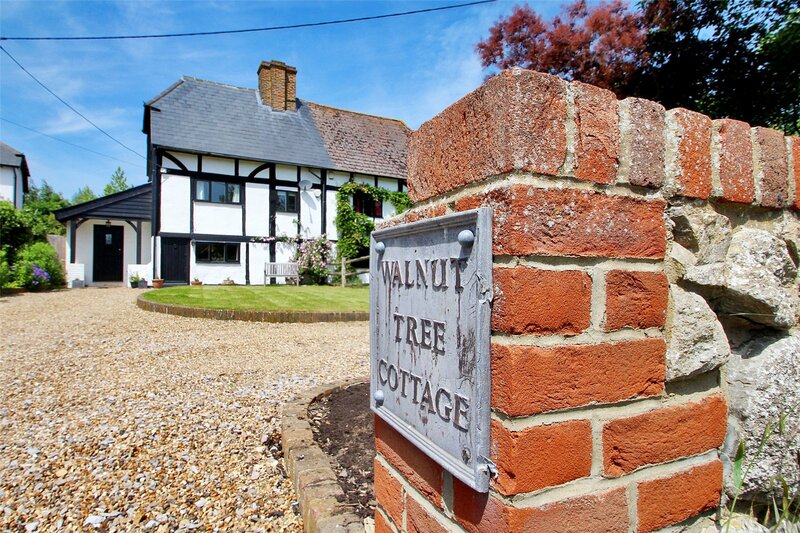 Walnut Tree Cottage will be found shortly before the end of the road on the left hand side. PROPERTY INFORMATION Services: Mains Water, Electricity & Drainage. Gas fired Central Heating Local Authority: Tonbridge & Malling Borough Council Tel: 01732 844522 Council Tax band (2018/19): E Fixtures and fittings are excluded from the sale but may be available by separate negotiation.